Hey all. 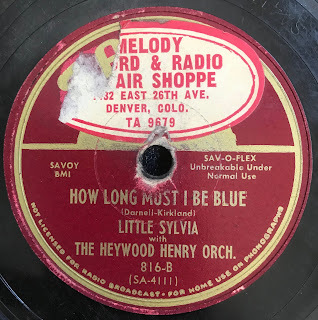 A snowbound day at the casa has me working on a much-neglected project - going through my stacks of 78rpm records. 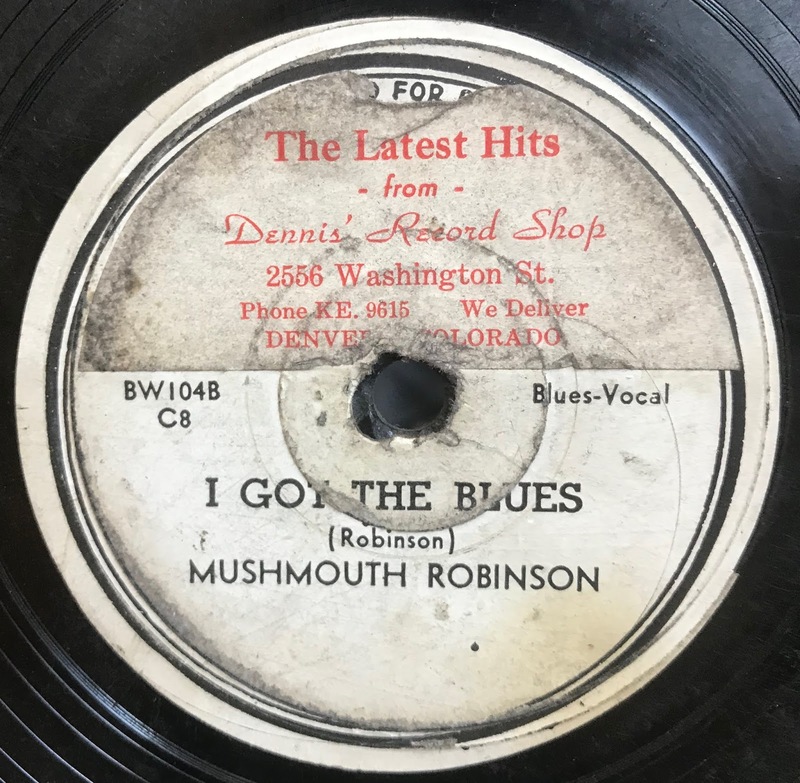 Most of these are not Colorado recordings (lots of hillbilly and some blues, collected from my 1980s West Texas zip days), but one record stood out, for the emphasis of this blog - a 1946 Mushmouth Robinson boogie woogie jazz recording, with an original Denver record store sticker on the label. 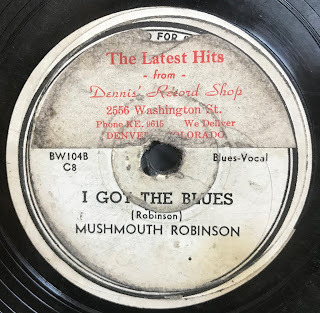 "I Got The Blues" / "Let's Get Some"
"Teardrops in Your Eyes" / "Please Open Your Heart"
"How Long Must I Be Blue" / "Little Boy"
Dennis' Record Shop, located at 2556 Washington St. now shows a block of newly-built apartments. 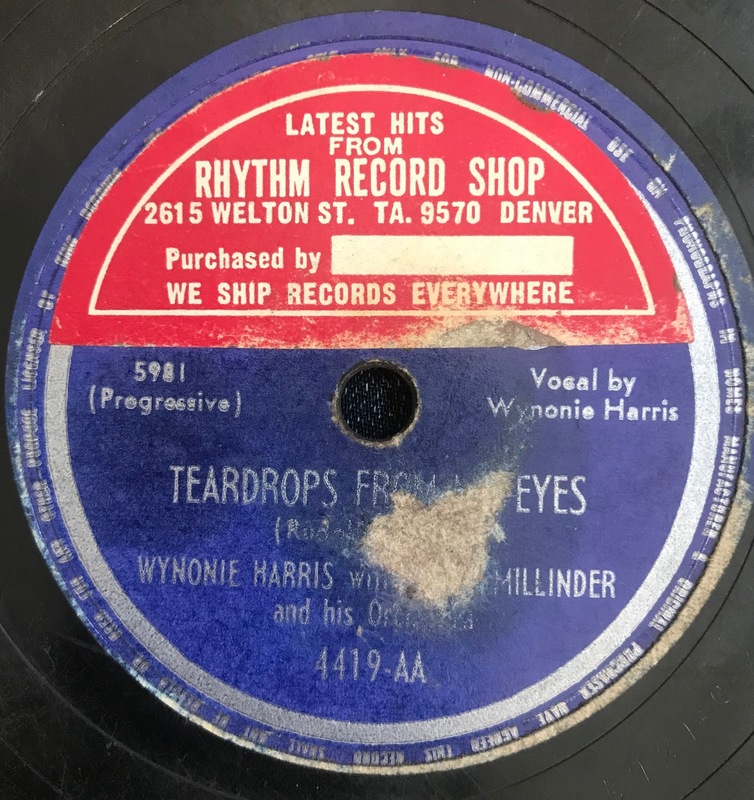 The Rhythm Record Shop, was located at 2615 Welton, and the Melody Record and Radio Shop, was located on East 26th, all in the Five Points neighborhood. The Rhythm Record Shop is now a cannabis dispensary, while I can't make out the complete address for the Melody Record and Radio Shop, to determine its fate. Five Points has a fantastic local music history. It became a predominantly African American neighborhood in Denver because discriminatory home sale laws in other neighborhoods forbade African Americans from settling in them. From the 1920s to the 1950s, the area's Welton Street had a rich history of jazz - with more than fifty bars and clubs, where jazz musicians such as Billie Holiday, Duke Ellington, Miles Davis, Nat King Cole, Count Basie, Dizzy Gillespie, and others performed at clubs like the Rossonian and the Rainbow Room. The neighborhood was also mentioned repeatedly in Jack Kerouac's On the Road. As always, if anyone has an info, drop me a line!